On January 15, the Russian invasion army’s “final push” started on the – until then – Ukrainian army and volunteer forces-held Terminal one and the airport’s control tower. Since then, the war for the airport es escalating. On the ground and regarding the information who controls what. While the Russian side claim, it controls the entire terminal since January 16, the Ukrainian administration claims, it “repelled” all attacks and “holds the terminal”. So one side lies?! Not sure as the truth mostly is located somewhere in the middle – or in this case: in different parts of the large terminal complex. Later more on this. Since the start of fighting action inside the terminal, I am trying to make sense of the video material coming out of the building, trying to verify reports and claims of both sides. Doing this, it is not as easy as many pro-Ukrainian “experts” claim, saying: “Russia always lies. Their media is a pure propaganda tool” or even “This cannot be the terminal as the Ukrainian army holds it, according to its statements.” – Of course: Russia lies! They transport their propaganda in every second they report from and of occupied Donbas. But the sheer existence of footage from certain areas and locations proves that there is a true core in what they claim from a very basic, almost “physical” point of view, meaning: When you report from the terminal and prove this with – meanwhile – hours of footage in 5 days, you are in the terminal, no matter what your or the opposing propaganda makes our of your claims. Having said this, I can and must use all available footage from the area instead of believing what either side claims to explore the current situation and who controls what of Donetsk airport. And when 95% of that footage is from the Russian side, I will mostly use it, no matter its origin and propaganda purpose (as for the reasons I pointed out above). So this analysis is an attempt, based on as much footage and recent evidence as possible, without having the guarantee to be entirely correct. Most of the area is held be Russian forces, namely “Battalion Spartak” – Russian army forces with some paid mercenaries from Russia and very few Ukrainian-born fighters- under the leader of terrorist “Motorola”. 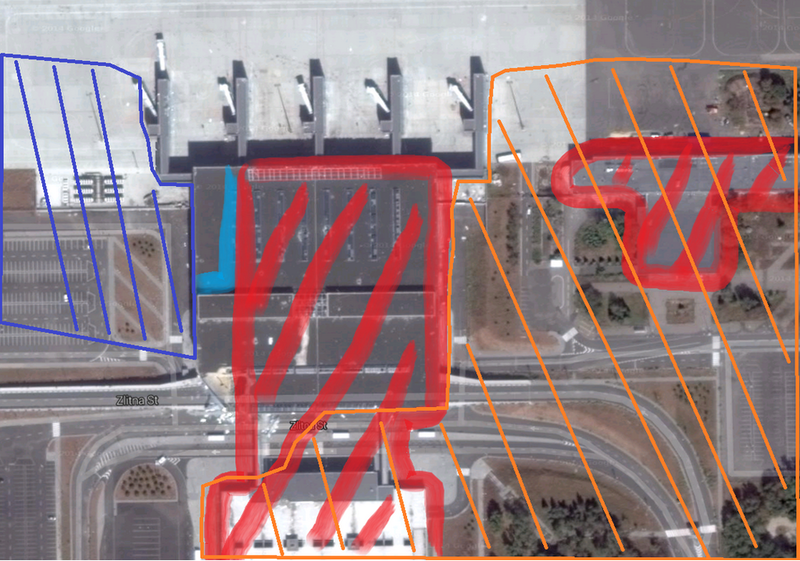 This includes – of course – the entire ruin of terminal 2 and even the apron in front of it but also the car park used as a bridgehead for Russian BTR-80 to bring new troops and ammunition to the terminal itself, almost hourly (see image below). 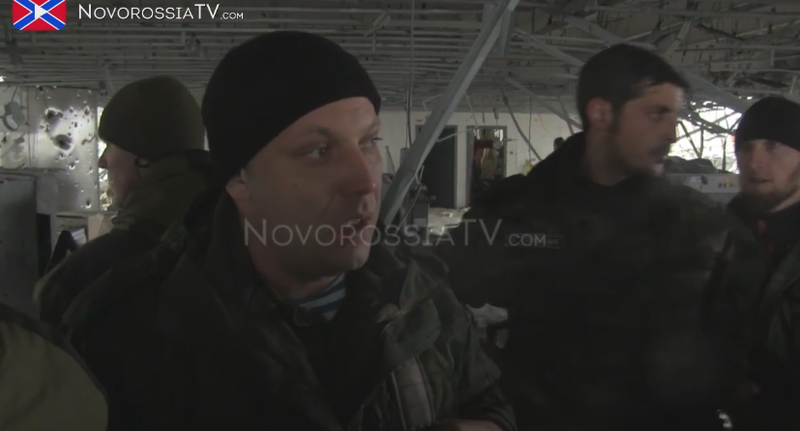 The “bridgehead” car park of Donetsk airport. However, the Russian-held area also includes most of the new terminal building itself, including the entrance area, the main airport hall, the entire eastern front facing terminal 2, the front area overlooking the gates as well as parts of the logistical facilities inside including the luggage transport section. (Please click on all links to see tweets with pictures proving those claims over the last 3 days.) On January 17, the Russian invasion army even regarded the northern terminal side next to the gates as safe enough to bring terrorist “DNR” leader Zakharchenko in, the possible highest profile target for Ukrainian authorities. While it can be argued that he surely was under the threat of being hit by Ukrainian artillery inside the terminal, under no condition would Russian have moved him inside it if there was the danger of armed confrontation with Ukrainian troops inside it. So they were VERY certain this would not be the case. 2. 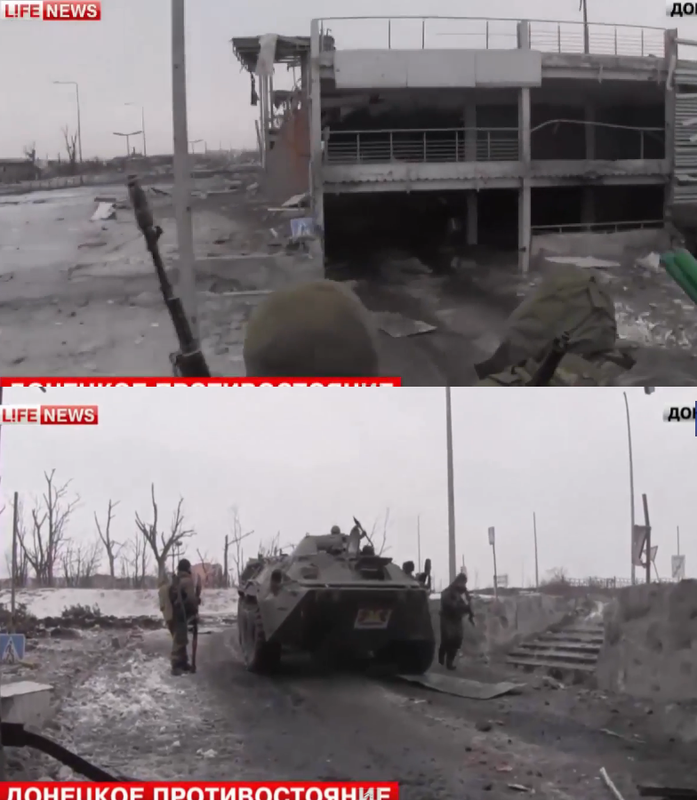 On January 15, Russians posted footage from all sides of the terminal, also looking out of the western front, recording shelling of the Donetsk airport tower. Since then no such footage appeared on the net. Also no other evidence, they are still in control of the western part of the building. This could mean, the Ukrainian army indeed “repelled” the Russian offensive in this part of the terminal around January 16, securing the crucial safe corridor to reinforce and resupply its defending forces in the western part of the complex. However, this is all it achieved, afterwards inflating this tiny success to a “full control” in its PR campaign… The January 19-created map below shows not only who holds what according to my analysis, but also “safe movement zones”, saying a lot about who controls which frontage and is able to fire from it and cover its area. Hence, these “safe zones” are not safe from medium range artillery and MLRS fire, but from direct enemy fire from the nearby buildings. 3. There are casualties among them. This point might sound odd at the first moment, but becomes clearer thinking about it. Ukrainian forces suffer multiple casualties inside the terminal which means they are still there. Just yesterday, 14 Cyborgs were injured inside it and evacuated under the cover of darkness this night, according to the Ukrainian NSDC. Over 50 were killed and injured over the last 5 days. Of course, one could argue that to save the appearance of an Ukrainian presence inside it, it could artificially “move” those casualties into the terminal from other locations, but this seems very unlikely as several volunteer activists confirm such dangerous MEDEVAC operations. So what to make out of it? According to my analysis, Russian forces control 90% of the terminal right now plus the entire southern and eastern surroundings of the mostly destroyed building. At the same time, Ukrainian Cyborgs are holed up in a small ground section in the north west of the terminal, still having a heavily embattled resupply line thanks to massive own artillery support and the inability of Russian artillery in Spartak and elsewhere to hits that part of the terminal. At the same time, this situation didn’t change largely over the last 4 days of heavy fighting. Russians couldn’t oust last defenders from the terminal and Ukrainians were unable to recapture significant parts of it let alone the strategically important surrounding areas and facilities. – If the last 5 months of fighting proves anything then “Who is in the terminal stays in the terminal.” and can only be ousted by months of heaviest artillery and missile shelling as well as massive own casualties (the Russian lost at least 500 men before being able to enter it). The last days showed that this is also valid for Ukrainian counterattack attempts. As a consequence, the current development must be seen as another military setback for the Ukrainian army and the government’s strategy to hold the frontline never mind to “recapture Donbas” or just the entire airport as president Poroshenko promised yesterday. It remains to see if the situation is really as “fluent” as many analysts claim since almost 4 days and territorial changes in and outside the terminal will appear in the short term. This article was an attempt to make sense out of what it looks at this moment and not even now as things MIGHT have changed overnight after massive clashes yesterday evening. Still it should be seen as a “situation mark”, from which further reasoning can start without falling into the trap of propaganda and inflated claims by either side involved in the conflict. This entry was posted in Ukraine by Julian Röpcke. Bookmark the permalink. Good work. It definitely makes sense. On the other hand, if all (!) the points of the Minsk agreement are respected, the ownership of this rubble pile will be of marginal importance. Carry on, Reporter, two thumbs up. Credit where credit’s due, this is a good analysis using the evidence we have available. But it’s a dynamic close-quarters environment with limited hard info, by nature impossible to tell exactly what’s going on. One thing to keep in mind – only focusing on the airport grounds itself risks missing out on the overall tactical picture. Both sides are supported by artillery in multiple other locations and I’d argue that those positions have much more overall impact on the outcome as troops holed up in ruined buildings using primarily small arms. Might be an interesting future project – who’s shelling whom, from where, and with what. While it would be impossible to get specifics on that, even a general idea helps. Ditto for a future project looking at supply routes in the area – where are they located and how are they threatened? Nice work overall. Want to know where are the artillery positions according to Mr. Lavrov ? None of the Reporter’s theses refuted, but more light on other aspects.